Florian Kamberi has revealed how he knew he had made the right move in joining Hibs within minutes of starting his first game. Frozen out in Switzerland, Kamberi was red-hot in Edinburgh. It took him just 28 minutes to grab his first goal for the Capital club after agreeing to move from Grasshopper Club Zurich on loan until the end of the season. And that opening strike in a 2-1 win over Motherwell on the final day of January was only the start, the 23-year-old going on to score nine goals in 14 appearances, ending up on the losing side just once in a run in which Neil Lennon’s players narrowly missed out on what would have been a fairytale return to the Ladbrokes Premiership with a runners-up place. Lennon only decided on signing Kamberi after an extended trial period, admitting he didn’t have the greatest of goalscoring records but believing he would add a much-need physical presence up front. It was a gamble to pair him with another new arrival, Australian forward Jamie Maclaren, the duo not only strangers to each other but Scottish football. 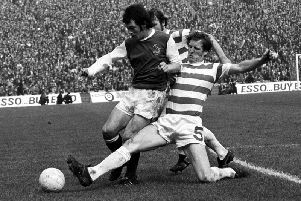 However, it paid off with 17 goals between them as Hibs ended up in a highly-creditable fourth place, wrapping up their season with an “absolutely bonkers” 5-5 draw with Rangers. Throughout Kamberi has remained coy as to his immediate future although Hibs do have a deal in place, an affordable fee agreed with Grasshoppers, the striker having returned home to contemplate on what happens next although he has readily admitted to thoroughly enjoyed his time in Edinburgh. And that, he insisted, was very much down to Lennon. “I felt his trust from the very first day I arrived and, if you feel that trust, you can almost play your best in every single game. You can play free without pressure. “That is what I was able to do and I have to thank the manager a lot because he gave me that trust. I don’t think I made one step forward working for him – I think I made two steps forward. Unsurprisingly, Kamberi revealed his most memorable moment was that first goal which came only minutes after he had rattled Motherwell goalkeeper Trevor Carson’s crossbar, a strike which even surpassed his hat-trick against Hamilton. He said: “Right there, I had a good feeling that I had made the right move, scoring my first goal on debut. “From there, every game I felt I was in the right place with the right team and the right manager. That’s why myself and all of the team has been successful. As always, there will be changes over the summer with midfielder Dylan McGeouch poised to leave Hibs while Maclaren will return to German side Darmstadt where he has two years of his contract to run and fellow loanees Scott Allan and Brandon Barker will rejoin Celtic and Manchester City respectively. Lennon has admitted that financially it may be difficult to bring Maclaren, Allan and Barker back on permanent deals but, given the agreement struck between Hibs and Grasshoppers, it would appear a return for Kamberi may be more realistic – if he wants it. He said: “The season has finished with a tough and interesting game and I’m now back with my family for holidays. Over the next weeks, we’ll see what is going to happen. “I’d been thinking game-by-game to give performances for the team, but now is the time to sit together with my agent. “I enjoyed the time at Hibs a lot. My team-mates are incredible. There will be some changes in the team, so we have to wait and see. Dylan going will be a big loss for Hibs. “You could see through the weeks he developed his performances with every game. Of course, every player wants to make the next step and he is now making his next step and I’m sure he will be successful in that next part of his career. “The manager will try to take the club beyond fourth place, but for this to happen, you have to invest in new players if some are going to leave. New faces will inevitably arrive in the coming weeks, Graeme Mathie, Hibs’ head of player identification and recruitment, has been working hard, as he did in pinpointing Kamberi and Maclaren, to identify potential signings. Kamberi, though, was adamant one thing at the club should remain the same, Lennon’s unswerving demand for the highest of standards. The Hibs boss let rip in no uncertain terms following the derby defeat that ended his team’s hopes of overhauling Aberdeen and Rangers but, insisted Kamberi, he was right to do so. He said: “It was a bad game for us. He is in charge and we have to follow his advice and his words. When we returned to play Rangers we saw the Hibs team every knows and that shows he was right.